Born of Earth: A Fairytale Ghost Story and Elemental Origins Novel by A.L. Knorr is the third book in the Elemental Origins series. With all her friends away, Georjayna decides to take up her mom's offer of spending the summer in Ireland with her Aunt Faith and her aunt's adopted son, Jasher. The trip should be the summer of her dreams; instead she learns her aunt doesn't have internet and Jasher doesn't greet her with a warm welcome. After she learns about Jasher's past and his deepest secret, she finds a surprising connection to him when she discovers strange and beautiful cocoons in the green house. As the two grow closer, Georjayna uncovers her family's strange secrets and a darkness lurking only she can see. As with the first two Elemental Origin stories, Georjayna's is unique and fitted around who she is as a character. Being an elemental origin story, this is the origin of earth so Georjayna quickly discovers her ties to earth which go beyond the standard ideal of what you think of as representing earth. She's looking for an escape for the summer but what she gets goes against what she was hoping for. The action quickly kicks in after she arrives and takes off once she discovers Jasher's tragic past and his ghostly secret. The two bond over beautiful cocoons which have a magical secret of their own and slowly their relationship starts to blossom into more than friendship. Their relationship is at the heart of the story, so A.L. Knorr provides plenty of sweet romantic moments and a strong bond formed from both being someone dealing with feelings of being alone, and both looking for something more. Georjayna has her three best friends who are her deepest ties, which clash against her relationship with her mom. Her dynamic with her mom is nearly non-existent and often feels more like they're distant roommates than an actual family. But Knorr digs deeper into their relationship as Georjayna's journey in Ireland evolves. Jasher is isolated from society and the only one who has given him love and acceptance is Aunt Faith. Part of what makes their dynamic so strong is how they accept each other for who they are and build each other up. They have a romantic comedy back and forth at times which works splendidly with the overall tone, with a little fairy tale magic woven in for more spark added to the story. 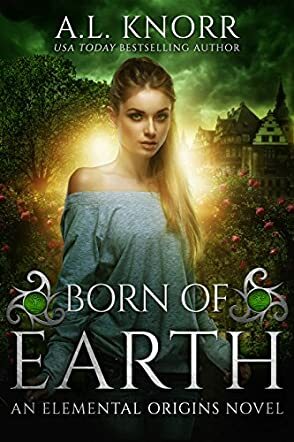 Born of Earth has a unique voice and take on fairies with magic, romance, representations of earth, and a ghost story that beautifully strikes a balance with magic and ghosts.